It is high time we concentrate on the fact that Internet of Things (IoT) is gradually touching different sectors and industries alike. Mobile technology has expanded in leaps and bounds with the introduction of Augmented and Virtual Reality, Artificial Intelligence, Machine Learning as well as the Internet of Things. At an initial stage, IoT app development companies worked on transforming an idea into an application to give relief to smartphone users where they can now perform the same task on a mobile phone while they are still moving freely. With the recent technological advancements, there has been a tremendous way in even beyond the imagination of us the humans. The expansion in technology has magnified the urge among humans to look forward to something which is not less than a dream. Working without complete human intervention is not possible. When you expect an electric gadget to work without human intervention then apparently it is a dream. Who must have imagined that they could lock and unlock their doors from any part of the world only with a few taps on their smartphones? We should thank those brainy beings who thought of this concept and made our lives easy. Internet of Things is one of those rare imaginations which have transformed our perspective of how we look at things. IoT has opened a wide array of options for the mobile application development companies. Rather than merely creating user-friendly mobile apps they can now develop apps which become part of the daily life of human beings. Eventually, IoT services have become an inseparable part of various industries. 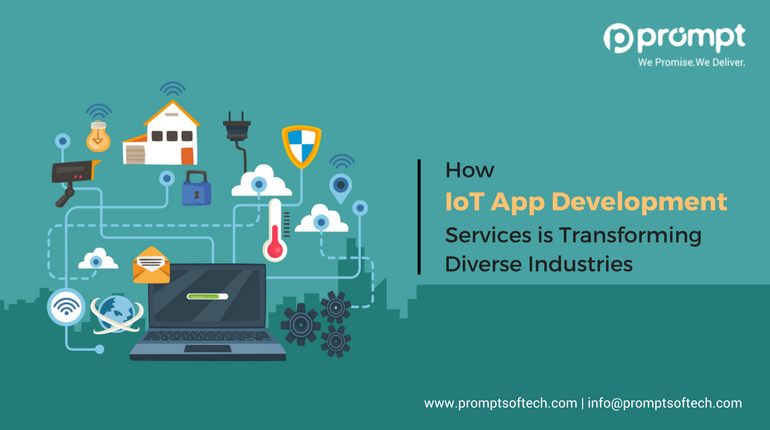 And the vast opportunities wrapped up within the scope of IoT have triggered many creative minds to apply those features to automate and interconnect other services. There are many factual pieces of evidence where the invention of IoT has been proved to be a blessing, and it has transformed how industries operate. Call it a trend or following the cat race, considering the influence it has created on various industries it is not a surprise that there is already a massive chunk of industries who have already adopted IoT services and an enormous section of the masses is in the process of deploying the same. The conventional way of teaching over dusty chalkboards have shifted to wireless interactive whiteboards is one of it. Tracking students and marking their attendance, permission-based access to students upon ticking off the attendance are a few examples of how IoT has transformed the way of educating. This industry gives a great platform to both the buyer and the seller alike hence customers have the benefit choosing from a wide range of personalized products. Retailers can leverage the smart virtual mirror and allow customers to customize their outfit, therefore, giving a considerable convenience to the customers by cutting down on visiting the stores on and off. Patients get a huge benefit here; they get relief from preserving unnecessary hospital bills. Hospitals can render real-time monitoring of patients to diagnose their illness and enter the data without any error. Hospitals find it easy to manage the drugs and medicines list and past trackback medicines prescribed to the patient. Wireless train services have been a blessing to people in metro cities who get stuck in traffic for hours. The wireless trains and vehicles are quick, convenient and affordable for commuters who want to avoid the traffic. Smart cash deposit machines; have simplified the complicated banking process. This eliminated the long queues in the bank to deposit or withdraw and also reduce the errors in calculating and entering the amount. Heavy construction equipment is being made operational with sensors, which can be distantly tracked for essential maintenance concerning excessive vibrations, temperature, and fluctuations. When uncharacteristic outlines are sensed, various alerts can be utilized to trigger maintenance workers to mediate in early stages before drastic failures can occur. Having predictive maintenance in this approach can thus save time, resources and money. The invention of IoT is an essential move towards achieving a smart way of living in smart homes which can be designed and surrounded by self-operated devices. The adoption of IoT industry has empowered businesses and their end clients alike. This will eventually eliminate human errors, give a structured way of pursuing things, enhance customer experience, and establish a strong position in the competitive world right from empowering workforce to integrating tedious processes. IoT services help businesses to stay abreast. Leverage IoT embracing total connectivity for your business and ease your life. Unarguably IoT has played a significant part in altering the conventional approach of conducting business. The pace with which each industry is adopting IoT services is inevitable, and it should not be a surprise when in next ten years almost everything will be automated. IoT app development companies continually upgrade themselves to come up with new applications which prove to be helpful in acting as a mediator to operate electronic gadgets or merely make them work with few commands and get your tasks done. As a far-reaching user and provider of IOT solutions, Prompt Softech believes in delivering swift and steadfast services. These services, as well as solutions, are well encrypted using multifaceted data-security algorithms, thereby upholding deep data confidentiality and authorized access management to our clients. Our IOT services seize the potential to enhance the competence of our client organizations and their processes. This effectively improves the overall productivity of specialized people by offering an uncomplicated and well-organized way to work over an assortment of different technologies and platforms. © 2018 Prompt Softech. All rights reserved.